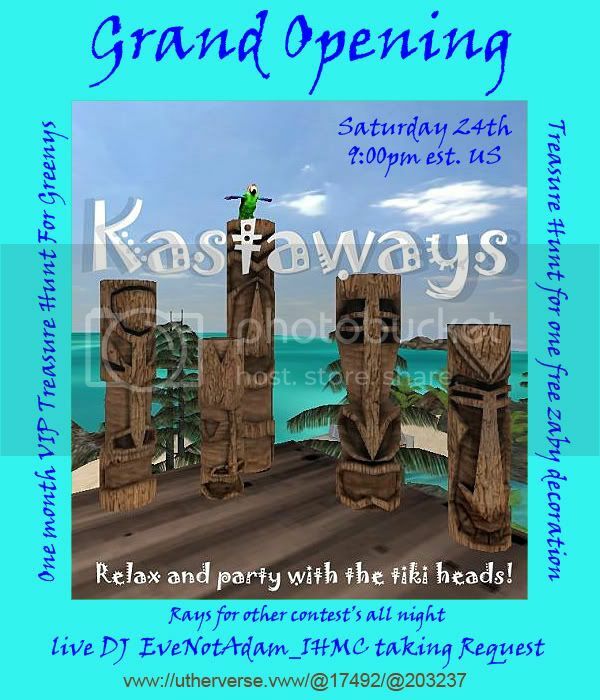 Come to our grand opening of Kastaways Island Saturday the 24th. There will be Rays given away for contest's, and for the first time, we will be giving away a grand prize of one month VIP in a greeny only treasure hunt. We wanted to be able to allow the greenys to have a fun place to party also, so tell all the greeny friends you know about this chance to become a VIP for a month. There will also be a contest for a free zaby decoration (regular size zaby only) and a decorated zaby for use one month prize. There will be a great DJ and dancing and more prizes and Rays to be given away all night so please come check us out and get your FREE kastaways cloths in our Yacht bar. you can port to the island at the listing below.